Learn how to crochet this pretty little washcloth in the easiest way, using a free crochet pattern with the step by step video tutorials. I’m sure you have already made some crochet washcloths and dishcloths before but I think this is the easiest one you could ever create with your own hands. Washcloths are always a joy to make. They are so beautiful, useful and what is most important very easy to make. Crochet washcloths can be super simple and eye-catching at the same time, that is why I make them frequently. Since they work up quickly, washcloths are a great instant gratification or a last minute gift crochet project. 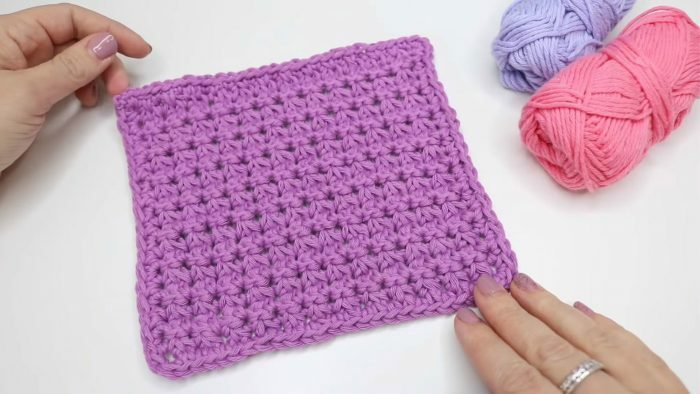 So, if you like our today’s topic and have a desire to crochet these kinds of lovely washcloths, you will just need to follow the easy step by step tutorials our friendly blog has brought you. Please, try to make every single stitch according to the instructions. There is no doubt you will love and appreciate these colorful washcloths. Good luck! If you have a desire to crochet yourself an eco-friendly, pretty little washcloth, I will show you how to make one with this step by step video tutorial. These easy washcloths are great to be made for yourself or as gifts. Enjoy your crocheting time and always feel free to share your opinion with us. Good luck!